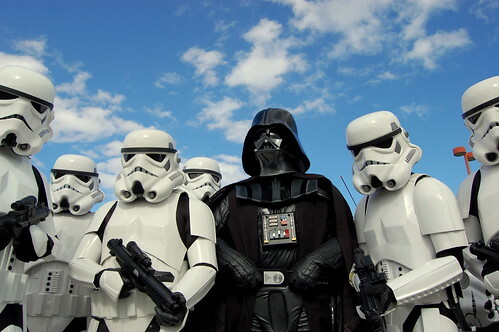 Every year, the 501st Legion goes to the polls to elect new leadership for the group. This year, my friend Mike Brunco and I decided that we were going to run for the leadership roles, with Mike taking on the Commanding Officer position, and with me taking on the Executive Officer post. Last night, at 7pm, Mike gave me a call and gave me the news: We'd won, and for the next year, the New England Garrison will be led under our command staff. Needless to say, we're thrilled and happy to be given the opportunity to lead the group. Our reasons for running are mixed: we've both been troubled by levels of drama that have escalated in the group over the past year, and a lack of direction for the group as a whole. We're hoping to fix both. Interestingly, my day job has contributed to this: the past couple of years have been ones that have emphasized how an organization works, and how effective leaders lead. We're looking forward to putting some of the lessons in place. Despite our status as a volunteer organization, and that a lot of us do this sort of thing for fun, the coordination and direction for a group is a complicated, dedicated thing to undertake. We don't want to have an organization that just continues business as normal: that's a failure point for a lot of places, inside the business world and outside of it. We have a mission and passion that we want to keep going into the future, and we need to make that happen ourselves: I've no doubts that we'll be able to do that. Lots of work in the meantime, though: we have ten days to get everything we want to do in place from a new way of bringing in recruits, putting our team together and so forth. It's going to be a good year, I think.